Will Smith's unbeaten 142 enabled promotion-chasing Hampshire hold out for a draw against Kent in Southampton. After a morning washout, the 31-year-old, who resumed on 66, put on with Liam Dawson (40) before the latter was bowled by James Tredwell (4-110). James Vince made a swift 27, but Adam Riley (4-36) swept the hosts batting line-up aside in tandem with Tredwell. But Smith and James Tomlinson clung on for 11.4 overs as Hampshire ended on 248-9 to save the game. If Hampshire beat Glamorgan in Cardiff next week they will be promoted. However, if Hampshire can only secure a draw with maximum bonus points or fewer then Essex could finish in second spot with a maximum bonus points victory at home to already-promoted Worcestershire. Smith, who passed a 1,000 first-class runs during the match, spent over five-and-a-hours at the crease and hit 16 fours in his innings. It was the 12th draw between the two counties in their last 16 Championship matches, with Hampshire having claimed three wins and Kent one in the other four games. Following Essex's innings and 79-run victory over Leicestershire, Hampshire head into their final Championship match knowing that only a victory will guarantee promotion to Division One for the first time since 2011. "Time went slowly for the rest of the team on the balcony and we were counting down the overs, but the last-wicket pair did a terrific job. "In terms of resilience we have shown ourselves a tough team to beat this year. "Ervine (in the first innings) and Smith dug us out of a hole with their centuries. They were magnificent." 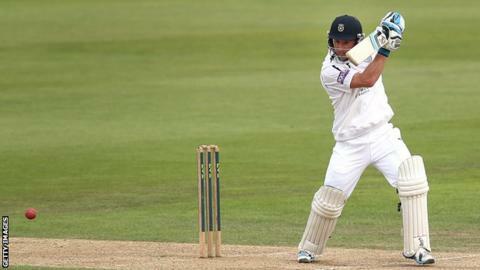 "It was disappointing to have got so close, taking 19 Hampshire wickets in two and half days. "I enjoyed bowling in tandem with Treds, but after something like 85 overs in that time, he is a bit sore now. "He bowled fantastically before and after tea when there was a flurry of wickets, but Smith knuckled down and batted superbly." "The draw feels more like a win for Hampshire, who now take a 10-point advantage over Essex into next week's final round of matches. "Six wickets fell for just 30 runs either side of tea, which ensured a naiil-biting finish. "Hampshire hung on thanks to the 29 overs lost to the weather in the morning and the magnificent 142 not out from Will Smith, who ensured that the Kent spinners were kept at bay - but only just." "Wow! What a final day! Even though the first session was lost to a storm, most could not have imagined the drama that was served up after luncheon. "Hampshire's batting crumbled before the twin spin of James Tredwell and Adam Riley giving Kent hope of a victory. "They were kept at bay by a Will Smith innings of selfless batting in the interests of his team. "The chance for a last-hour dash for runs was denied to Kent as he turned down personal runs to salvage the game for Hampshire."